I enjoy electronics; I enjoy the outdoors; I enjoy lots in life that aren't chores. IoT and connected devices hold the solutions to problems on all ends of the spectrum, from areas such as agriculture and industrial automation, to letting you know when your food is about to go bad. For me, the greatest potential for IoT (yes, I realize there's so much more) is the potential to eliminate life's maintenance activities, leaving more time for the stuff I enjoy doing. If I can minimize the amount of time I spend cleaning my house, figuring out what I need on my shopping list, or even just turning on the lights I turn on when I get home at night, I'll deem IoT a success. 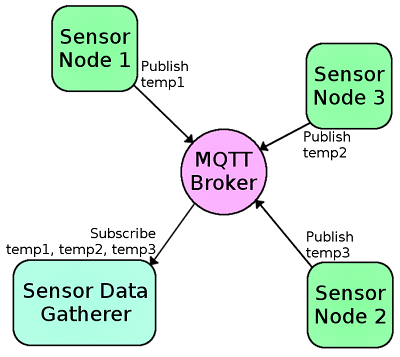 For those looking to make my dreams come true, a good first step is learning MQTT. MQ Telemetry Transport (MQTT) is a machine-to-machine messaging protocol aimed at IoT. It's designed with a lightweight messaging service that's perfect for remote nodes or sensors. One of our engineers, Alex, put together a great tutorial on getting started with MQTT with the very popular Raspberry Pi platform. I highly recommend it as a quick taste of what MQTT and IoT have to offer. The tutorial can be found here, and more information can be found on most project websites (it's a very popular thing these days). Very nice article! Thanks for sharing this material. I use intensively MQTT in local network to control Arduinos and Raspberries in Escape Rooms (up to 20 IoT boards per room) and it's definitively to right choice.Starting 3 years ago with TCP streams, MQTT is much much better. I don't see any other protocol to compete out there. My company will publish commercial software to control Escape Rooms and free open-source librairies code for Arduino with Bridge (YUN) and Python libraries (Pure Python, asyncio, Kivy and Pygame oriented libraries and PySide/PyQt5 libraries). On Raspberries I use paho-mqtt python lib, on Arduinos I use PubSubClient and on Windows I use C++/Qt/QMqtt. MQTT protocol is light and efficient across local networks but can be used over TCP (and websockets) over wide networks (in such a case, security might be addressed properly). Because MQTT is plain text (and can be used for huge binary files as well) it's a pleasure to work with and debug data exchanges)..
Hey, it's also super vulnerable. Be careful: setup ACL and SSL for your broker, otherwise you may be spied upon! You might want to try the Espurna firmware by Xose Perez (tinkerman). You can find it here: https://github.com/xoseperez/espurna. Espurna will give your ESP8266 device a Web UI and OTA updates, integration with MQTT and common attached sensors. Espurna builds best with PlatformIO but there is a Wiki showing how to build it using the Arduino IDE. I was very impressed with it once I got everything working. The Wiki helps and you can post questions to the Espurna community forum. Using node-red and mosquitto on a raspberry pi is the nicest MQTT config. I update that with handy tips for that exact configuration. Second, the "wish list" includes the obsolete Raspberry Pi 3 B, rather than the current Raspberry Pi 3B+.